The risk of knee osteoarthritis in the intact limb of longtime unilateral amputees is much higher than in non­amputees, and the range of potential contri­buting factors is even more complex. Optimizing prosthetic fit and function, in addition to more conventional OA interventions, can help address gait issues that contri­bute to knee joint degeneration. 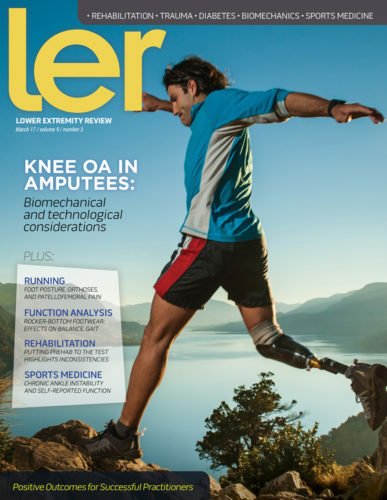 Researchers and clinicians who work with unilateral lower limb amputees are increasingly exploring the effects of prosthetic devices on gait asymmetries and joint loading. What’s less well known is that prostheses designed for use above the waist can also have positive effects on gait. Clinicians don’t often have expensive biomechanical testing equipment to improve their assessment of injury risk in athletes, but a growing body of research—including several studies presented in February at the American Physical Therapy Association’s Combined Sections meeting in San Antonio, TX—suggests standard clinical tests can help fill that void. High school girls who specialize in one sport are more than twice as likely to suffer a moderate to severe injury as their multisport counterparts, according to research from San Diego State University in California. Running gait modifications designed to reduce patellofemoral loading also have immediate symptomatic benefits in patients with patellofemoral pain, according to research from Laval University in Quebec City, Canada. Although slip-resistant footwear can play a key role in preventing accidents related to wintry conditions, most styles don’t do the job, according to researchers from the Toronto Rehabilitation Institute in Canada who have set out to change the situation. Patients who undergo surgery for hindfoot fracture can safely start physical therapy two weeks later, which could provide an opportunity to improve outcomes, according to research from Utah presented at the American Physical Therapy Association’s Combined Sections Meeting. In patients with diabetic peripheral neuropathy, pedal bone health declines progressively in conjunction with worsening renal function, according to research from Washington University School of Medicine in St. Louis, MO. Insoles with sensory-enhancing technology, previously demonstrated to help address balance and proprioceptive deficits, can also improve agility in athletes, according to research from Harvard University in Cambridge, MA. A study published in January found alerts given by Calgary, Canada-based Orpyx Medical Technologies’ smart insoles at least once every two hours could help enhance patients’ adherence to offloading cues. The Indianapolis, IN-based International Federation of Sports Medicine (FIMS) in February made Current Sports Medicine Reports (CSMR) the organization’s official journal. It’s now available to all FIMS members at acsm-csmr.org. The Chicago-based American College of Foot and Ankle Surgeons (ACFAS) reported in March that its 75th anniversary annual Scientific Conference, held February 27-March 2 in Las Vegas, drew more than 1900 foot and ankle surgeons and featured a sold-out exhibit hall, making it the largest-ever conference for the organization. The Rosemont, IL-based American Academy of Orthopaedic Surgeons (AAOS) in February announced the appointment of Thomas E. Arend Jr, CAE, as CEO. Arend, whose appointment is effective April 1, will work directly with the AAOS board of directors and executive management team to oversee a staff of 250 and manage an annual budget of $60 million. The Alexandria, VA-based American Physical Therapy Association (APTA) launched the Physical Therapy Outcomes Registry at its Combined Sections Meeting in San Antonio, TX, held February 15-18. The Chicago White Sox in February named Nikhil N. Verma, MD, head team physician for the Chicago White Sox. Verma is a sports medicine physician with Midwest Orthopaedics at Rush and director of the Division of Sports Medicine for the Department of Orthopedic Surgery at Rush University Medical Center. Buffalo, NY-based Tru-Mold in March announced it is extending its Thera-Medic package by applying special practitioner pricing to every shoe in its catalog, including a choice among 13 leather colors, common shoe enhancements such as padded tongues/collars and closure methods, and three pairs of 1/4″ pink and 1/4″ white Plastazote inserts. The Vail, CO-based Steadman Clinic and Vail Valley Medical Center cut the ribbon on their expanded 26,056-square-foot facility, which includes the new Steadman Clinic and the Steadman Philippon Research Institute’s surgical skills lab, robotics lab, regenerative medicine lab, biomotion lab, and administrative offices. Hiram, GA-based Pedors Shoes in February announced its pedors247.com business-to-business ordering website is now fully mobile responsive. The Owings Mills, MD-based Board of Certification/Accreditation (BOC) in February established the Jim Newberry Award for Extraordinary Service, an honor named after longtime practitioner, BOC board member, and leader James Newberry Jr, BOCP, BOCO, BOCPD, who died last year. Below knee amputee Guy Disney on February 17 at Sandown Park in Esher, UK, became the first prosthesis-wearing jockey to win at a professional racecourse in Britain. The Rosemont, IL-based American Orthopaedic Foot & Ankle Society (AOFAS) and M2S, a hospital technology and ser­vices provider headquartered in West Lebanon, NH, in February launched the Orthopaedic Foot & Ankle Outcomes Research Network (OFAR), a patient-reported outcomes data collection system. The American Podiatric Medical Association (APMA) honored Paul J. Liswood, DPM, with its 2016 APMA Meritorious Service Award in late January at the New York State Podiatric Medical Association (NYSPMA) Foundation for Podiatric Medicine’s Podiatric Clinical Conference and Exhibition. Valencia, CA-based Bioness reported in February that it has received US Food and Drug Administration (FDA) clearance for its functional electrical stimulation device system, which includes thigh and below-knee cuffs, an in-shoe gait sensor, and a wireless control unit. Pro-Tech Athletics introduces the Orb Extreme deep tissue massage ball, designed to reduce muscle fatigue and tightness, promote flexibility, and enhance athletic performance. The new device is firmer and features more prominent massage bumps than the company’s standard Orb. Tri-Stretch is a portable exercise device designed to lengthen muscles three dimensionally. The Tri-Stretch program allows the user to stretch and strength­en in three directions—forward/ backward, side-to-side, and rotational—with multiple joints work­ing simultaneously, replicating the demands of sport. Medi-Dyne announces the new­est addition to its 2Toms line of blister-prevention, chafing, skin-guard, and odor-eliminator pro­ducts. FootShield is a moisture and odor-control product designed for daily use. It contains a blend of natural antifungal ingredients and moisturizers, including jojoba, grape seed, and tea tree oils.